Time for another awesome cover reveal from Spencer Hill Press's imprint Spence city! "Matt Danmor thinks he’s lucky. Not many people survive a near death accident with nothing more than a bout of amnesia, a touch of clumsiness and the conviction that the technician who did the MRI had grey skin and hooves. Still, it takes time to recover from trauma like that, especially when the girl who was in the accident with you disappears into thin air. Especially when the shrinks keep telling you she’s just a figment of your imagination. So when the girl turns up months later looking ravishing, and wanting to carry on where they left off, Matt’s troubled life starts looking up. But he hasn’t bargained for the baggage that comes with Silvy, like the fact she isn’t really an English language student, or even a girl. 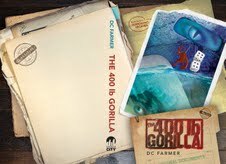 The 400 Lb Gorilla is caustic, (vampire-free) introduction to the Hipposync Archives: Contemporary fantasy at its sparkling best." It is, isn't it? I love this cover and it sounds so great!